That is, capoeira practitioners, capoeiristas, claim their arduous training regimens produces perceptual, psychological and physiological transformations (Downey 2005; see also Grasseni 2004). I started to wonder if these reported changes were empirically observable or neurological plausible.3. The question of plausibility drove me to consult research on perceptual plasticity, skill acquisition, and, eventually, neuroscience. At the same time, fortuitously, the brain sciences have also seen an efflorescence of interest in cultural differences in cognition that extends to cultural neuroimaging.4. Unfortunately, much of this research frames cultural difference in unsophisticated ‘East v. West’ terms. The old anthropological fears of ‘neuroreductionism’ likely will become a self-fulfilling prophecy, however, if anthropologists—who have more sophisticated understandings of enculturation and non-innate variation—do not participate actively in the emerging collaborations.5. This paper presents a neurologically plausible account of how capoeira training affects one dimension of skill—learning to balance in a handstand—before offering a brief ethnology of diversity in equilibrium training across cultures. The goal is to highlight plasticity, diversity, and enculturation in the equilibrium system. Some theorists of mind have suggested that the neurological apparatus maintaining balance is among the ‘best examples’ of a neural module, that is, a specialized, pre-programmed part of the brain. 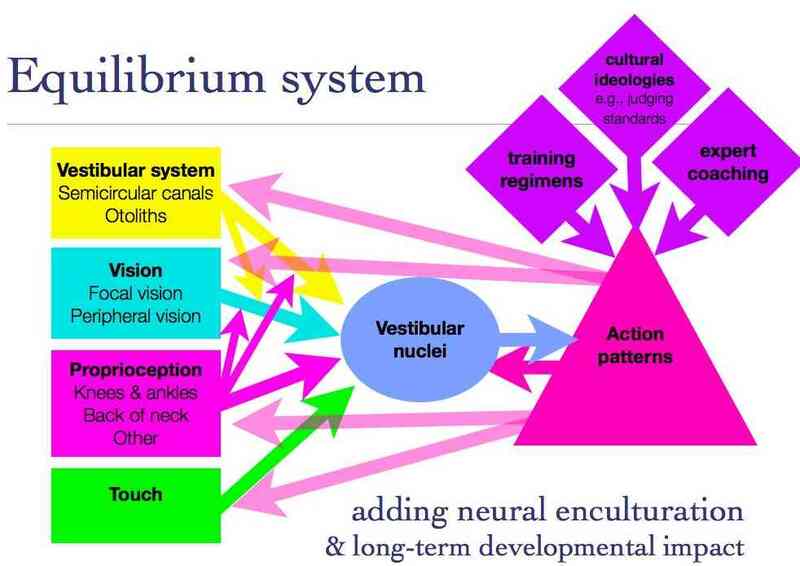 The ethnological diversity of equilibrium training, and the plasticity of what I will describe as a ‘nodular’ system, however, severely undermines the argument that a pre-programmed equilibrium-maintaining mental module is unaffected by outside information, demonstrating instead that even this basic and largely unconscious neural function can be encultured. 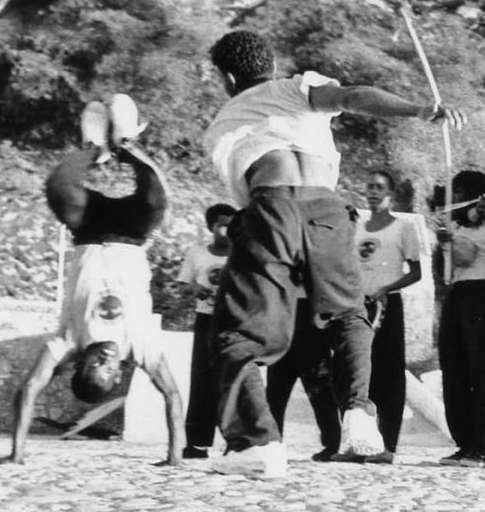 One of the hallmarks of Capoeira Angola, the traditional style of the Afro-Brazilian art that I studied in Salvador, Brazil, is that a wide range of techniques are done in an inverted posture, in headstands and handstands. Brazilian capoeiristas call a handstand a bananeira, a ‘banana-tree,’ and the most virtuoso develop extraordinary comfort in upside-down positions, walking about, shifting postures, and playing while upside-down. If I had more technical savvy and free memory from WordPress, I could show video of players kicking with their feet while balanced on their hands, for example, or skilfully moving about. 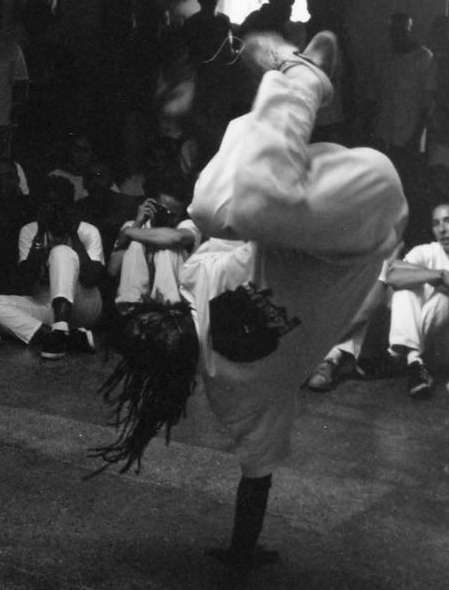 Unlike a gymnast in a handstand, however, a capoeirista in a bananeira or au (cartwheel) must not look down at the ground; to look at the ground, rather than one’s adversary, invites a headbutt or other attack. Instead, practitioners tuck their chins toward their chests and move their heads to track another player during a game. A handstand in gymnastics is ideally static, symmetrical, and tightly controlled; the bananeira is dynamic, mobile, and maintains no specific posture. On the contrary, experts told novices that changing postures, curling up the body, or flailing the legs, prevented an opponent from finding a vulnerability. To understand why this difference is significant, we must examine the neurology of equilibrium. Although psychologists typically say that the organ of balance is the vestibular system, located in the inner ear, in fact, equilibrium is what psychologist James Gibson called a ‘sensory system’ (1966, 1979). In day-to-day activities, people maintain upright posture by using a number of senses and a range of largely unconscious postural adjustment strategies (Horak and Macpherson 1996; van der Kooij et al. 1999). Normal upright posture, for example, is maintained by sensations from the vestibular system, the semicircular canals in the inner ear (three to a side) and the otoliths (pairs of small bones in either ear); but also by vision, proprioception, especially at the ankles and joints, and pressure sensation on the soles (Mergner, Maurer, and Peterka 2003). When we stumble forward, we know we are falling because the otoliths sense the head’s acceleration and shift relative to gravity, the ear canals register the head’s forward pitch, our legs feel out of position under us, our joints no longer align, the pressure diminishes on our soles, our visual field starts to fill with the ground, and our peripheral vision detects the blur of ‘optic flow.’ This information triggers stereotyped adaptive movements, such as the vestibulo-spinal reflex, through very short excitatory links to the motor neurons that trigger extensor or anti-gravity muscular tone. In other words, the ‘sense’ of balance is actually a synthesis of diverse inputs and often-unconscious patterns of compensatory behaviour. Confronted with challenges like running, moving in the dark, or standing on a shifting surface, the equilibrium system must ‘re-weight’ the various inputs, sort out disparities between sensory flows, discount or wholly ignore misleading proprioceptive, vestibular, graviceptive, or visual information (See Mahboobin et al. 2008; Oie et al. 2002). For example, as we walk, our otoliths sense acceleration, but proprioception that our legs are moving leads the equilibrium system to discount the vestibular indication that we might be falling. In addition, different contexts limit the ways that the body can respond to instability; for example, carrying a child, we cannot use stereotypical movements of the upper body to prevent ourselves from falling when we slip. Training affects these patterns: gymnasts on the balance beam, penalized for obvious movements to right themselves, have to switch between primarily ankle-based or hip responses to stay on a narrow surface, and I found my vestibulo-spinal reflex suppressed after several years of falling over into capoeira techniques (See Marin et al. 1999; Downey 2005). This fact that the bananeira and an Olympic gymnastics handstand demand distinctive motor-perceptual ways of achieving balance was brought home especially vividly for me when a visiting Swiss capoeirista, a long-time practitioner of circus-arts, complained bitterly that the different head position prevented her from transferring expertise in circus handstands to the bananeira. I had assumed circus would be an ideal form of cross-training. 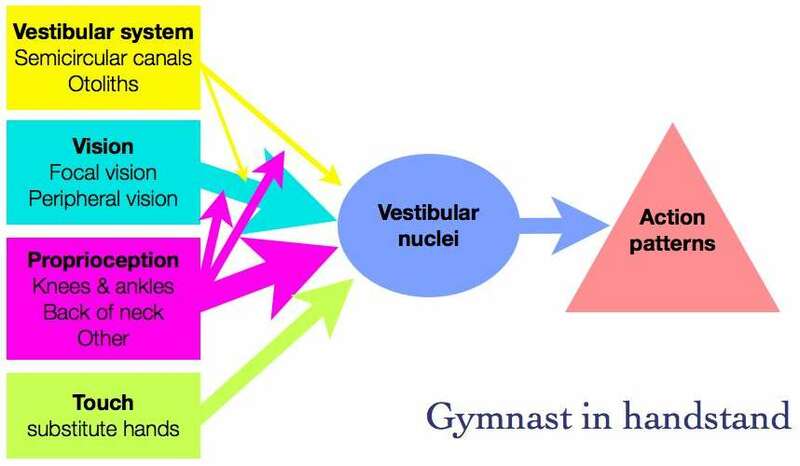 Specifically, learning an Olympic handstand typically necessitates developing perceptual strategies to substitute visual information for radically altered, even counter-productive vestibular information. Not only are the vestibular organs in a new position, but the head is no longer on the top of body (which is effectively taller because the arms are extended), so becoming unbalanced does not cause the same instant, pronounced acceleration to the otoliths that occurs in normal bipedal position. Most gymnasts focus their eyes on the ‘cliff edge,’ a visual anchor point about five centimetres in front of the wrists and equidistant between them (Clement, Pozzo and Berhoz 1988). Gauthier and colleagues (2007) found under experimental conditions that vision, both focal and peripheral, accounts for approximately 47% of balance in a handstand, but that the proprioceptive sense of one’s own neck was also significant, helping maintain balance when the head is flexed backwards (the Olympic head positioning) (see also Clement and Rezette 1985). Steven Vogel (2001:82-83) points to the high concentration of muscle spindles in the nape of our necks, the stationary position of the head in vigorous movements, and the head-first righting reflex of many animals to suggest that head position is a crucial link between vestibular information in the head and the whole body’s position. How then do capoeiristas balance? Although comparable laboratory data on the bananeira simply is not available (yet? ), ethnographic observation and apprenticeship do offer some likely candidates. With head position fully inverted and vision essential to tracking an adversary, both vestibular and visual information are severely compromised for balancing purposes. The only other candidates are touch, proprioception, and righting behaviours; I suspect capoeiristas maintain inverted balance by relying more heavily on proprioception and sensitivity through the hands, coupled with a very quick, refined learned pattern of hand-stepping reflexes. For example, unlike gymnasts, capoeira practitioners trained hard at walking on the hands, artificially forcing themselves to practice variations, such as turning in a circle, hand-walking in place, or lifting each hand high, even touching the chest. In addition, studies of gymnasts find they avoid bending their elbows to shift their centres of gravity up or down, employing this righting strategy only as a last resort (Gauthier et al. 2007; Marin et al. 1999:624). 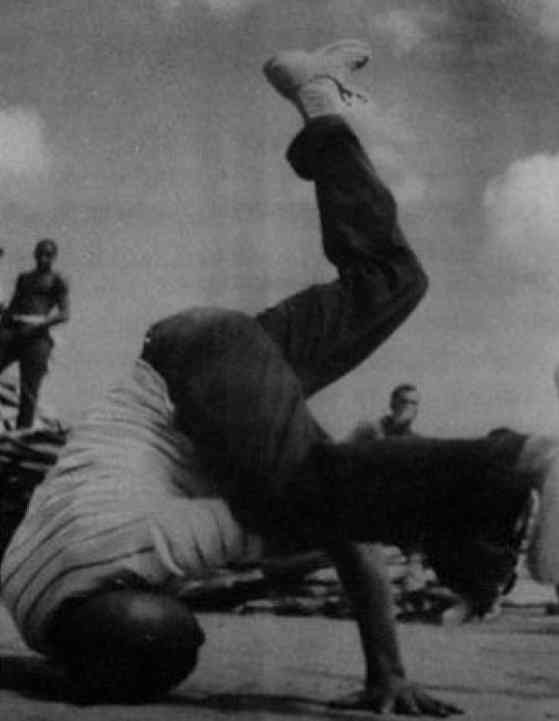 In contrast, capoeira practitioners frequently bend their elbow to maintain balance in a bananeira; training drills require it, such as jumping over a chair into a handstand or lowering and raising oneself between hand- and headstand.6. A wider survey of sports and dance finds a range of other challenging activities in which people balance, shifting the weighting of sensory input for maintaining equilibrium or motor patterns for maintaining balance. For example, dancers in ballet and jazz dance must learn to use visual ‘spotting’ when spinning as centrifugal force in the vestibular system confounds it. In contrast, break-dancers and ‘whirling dervishes’ must find non-visual ways to maintain upright positions when spinning with their heads rapidly rotating. ‘Spotting’ is not simply the automatic, non-conscious result of the task constraints; teachers explicitly instruct and then systematically drill novices in order for their equilibrium systems to function properly in this technique. Expanded 'equilibrium system' showing channels for modification. Perhaps the most radical demonstration of plasticity in the equilibrium system, however, is from the work of neuroscientist, Dr. Paul Bach-y-Rita, who has developed prosthetic devices for people who have lost their vestibular sense, a condition that makes them feel that they are perpetually falling.7. Bach-y-Rita’s remarkable prosthetic links a construction helmet mounted with an accelerometer to a set of electrodes placed under the tongue; the vestibular nuclei learns to interpret the sensation of soft electrical shocks on the tongue. Sense of touch on the tongue, in this extreme example, can be integrated into the synthetic sensory system of equilibrium. This plasticity, however, runs contrary to the argument that equilibrium is an innate human capacity. Philosopher and cognitive theorist Jerry Fodor, for example, writes that the ability to recover equilibrium is ‘a new contender for “best example of a module”’ (Fodor 2000:118, fn. 9).8. A ‘module,’ according to Fodor, is a domain-specific, encapsulated, quick, fixed functional system in the mind, which is inaccessible to conscious thought or information from outside its’ specific domain (Fodor 1983, 1988). Fodor and others interested in modularity build upon arguments in Chomsky’s work (esp. 1980, 1988), but also draw evidence from optical illusions, theory of mind, and localized neuropathology. Leda Cosmides, John Tooby and Steven Pinker, like a number of evolutionary psychologists, have claimed that the brain is ‘massively modular,’ composed of myriad innate, domain-specific computational mechanisms shaped by evolutionary pressures.9. 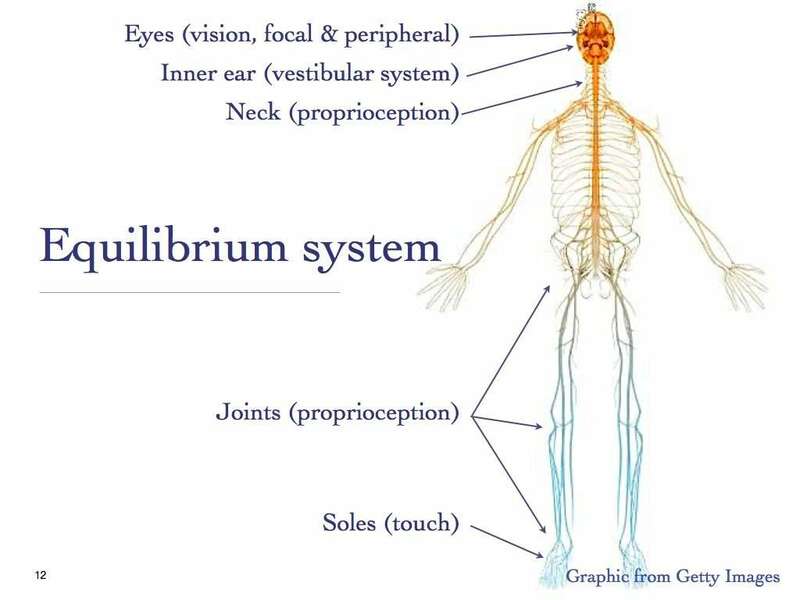 Given the evidence of multiple, variable inputs, trainability, cultural variation, and task-specific re-weighting, the equilibrium system looks more ‘nodular’ than ‘modular’; that is, rather than being encapsulated, inaccessible, innate, and pre-programmed by evolution, the equilibrium system looks like a plastic network of sensory inputs differently weighted, neural resources that can learn to interpret different information streams (even from the tongue! ), and trainable behavioural patterns. This dynamic systems modelling of the equilibrium system helps us also to see the many ways that cultural regimes, patterns of experience, explicit coaching, conscious training, and unconscious conditioning might affect the system any one person assembles, and the way that it handles specific sorts of conditions. Malleability can arise in a number of different places in the network.10. For example, extensive training might strengthen connections between certain kinds of visual inputs and the body’s network of perceptual and reflex actions that maintain equilibrium; or the network dedicated to equilibrium could be trained to provide stimulation to the hands, shoulders, arms and other parts of the body necessary to maintain a bananeira, rather than just the legs in normal bipedal posture. The enculturation might happen in modified weighting by the vestibular nucleus, or it might happen in more immediate peripheral modifications to the nervous system (see Notman et al. 2005. Boyden et al. 2004; Broussard and Lisberger 1992; Lisberger et al. 1994.). Looking at the organic dimensions of cultural embodiment, the way that enculturation affects neurological development and functioning, better allows anthropologists to participate in cognitive science debates. Neuroanthropology can bring to brain sciences a more sophisticated sense of how long-term developmental patterns such as skill training affect profound change in participants. But the effort also brings to anthropology a much more thorough consideration of individual-level experience and embodiment, replacing implausible (and often startlingly simplistic) implicit psychological models with testable, robust biocultural accounts of enculturation.11. Thanks especially to Daniel Lende, Paul Mason, and John Sutton for ongoing discussion of the material in this paper and to the Macquarie University Centre for Cognitive Studies for letting me present a very early discussion of these ideas. Initial stages of this research were supported by the Richard Carley Hunt Fellowship (GR 7414), The Wenner-Gren Foundation for Anthropological Research, Inc., New York. This paper is only a draft. Please contact the author if you would like to receive a copy of the eventual finished version. The paper is written as an oral presentation and has accompanying slides to diagram these transformations in the equilibrium system. Please note that even the schematic diagrams of the equilibrium system provided in this post are simplified. For a more complete discussion, see the excellent discussion of the vestibular system in Scholarpedia, curated by Profs. Kathleen Cullen and Soroush Sadeghi of McGill University. 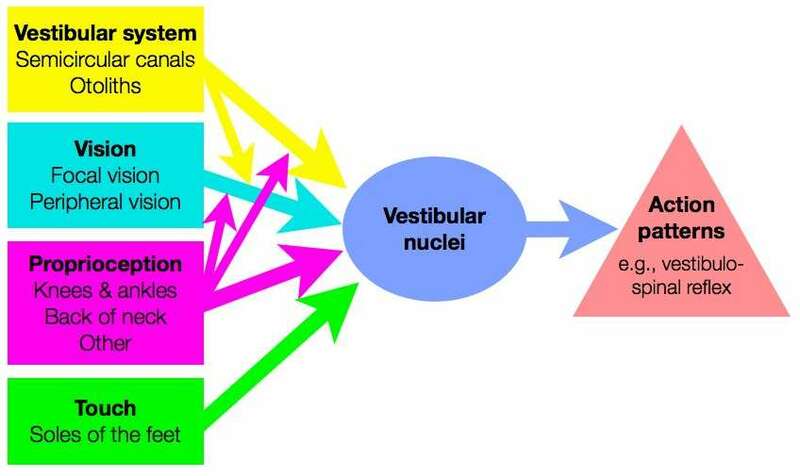 For example, there are actually four vestibular nuclei, although for the purposes of this article, differentiating them does not add significantly to the discussion. 1. On embodied cognition, see also Noë 2004; Thompson and Varela 2001; Varela et al. 1991; Wheeler 2005. On this site, see also Andy Clark & Michael Wheeler: Embodied cognition and cultural evolution and The Boston Globe on embodied cognition. 2. This is the short version of the rationale for my use of the term ‘neuroanthropology,’ which I took from Juan Dominguez, although he credits a long line of predecessors including Oliver Sachs and Charles Laughlin (e.g., 1992). For a longer version of the rationale, see the post here. 3. My movement toward neuroscience was also a form of what Daniel Dennett (1991) calls ‘heterophenomenology,’ although I did not know the term at that time. Dennett describes a phenomenology, much more akin to the work of early theorists like Maurice Merleau-Ponty, which takes into account a wide range of data to understand human experience, rather than privileging exclusively introspective reflection. The term is cumbersome, but it highlights the degree to which early influences on phenomenological philosophy, such as gestalt psychology and case studies of brain injury sufferers, have been neglected in contemporary anthropological ‘phenomenologies.’ On this site, one of the best discussions of the different facets of addressing experience is Daniel’s post, The Cultural Brain in Five Flavors. 4. For a review, see Han and Northrop 2008 (see Daniel’s discussion here). Earlier influential work includes Nisbett and Masuda 2003; see also Chiao and Ambady 2007; Chiao, Li and Harada 2008. For a critical discussion of cultural neuroscience, see my earlier discussion, Welcome to new readers: Why brain science needs anthropology. 5. For example, Martin 2000; see also Quinn and Strauss 2006 on anthropologists’ aversion to psychology. 6. John Sutton (2007) highlights the difference between ‘closed’ and ‘open’ skills, drawing on a distinction made by Poulton (1957). The gymnastics handstand is a ‘closed’ skill in that the environment is static, uniform and controlled, and the skill itself is in maintaining a precise motor pattern. In contrast, the bananeira is an ‘open’ skill requiring constant adjustment and improvisation in a changing environment, with a shifting adversary, unpredictable stream of events, even the possibility of interaction with ‘non-playing’ spectators (see Sutton 2007). 8. Fodor draws on the work of Cheng and Gallistel (1986) and Hermer and Spelke (1996), which actually seems to be much more ambivalent about the ‘modularity’ of equilibrium. On other forms of sensory integration that undermine the argument for strict modularity, see my earlier post, Children integrating their senses. 9. Anthropologists (except neuroanthropologists, perhaps) have typically encountered modularity theory through either the ubiquitous works of Steven Pinker (especially How the Mind Works ) or the evolutionary psychology of Leda Cosmides and John Tooby (See Barkow, Cosmides and Tooby 1992; also Hirschfeld and Gelman 1994; Pylyshyn 1999). For an incisive critique and constructive proposal for a revision of evolutionary psychology, see Wheeler and Clark 2008. For a critique of part of Pinker’s project, see Daniel’s earlier post here, Steven Pinker and the Moral Instinct. Similarly, Dan Sperber has been a proponent of evolved, task-specific modularity in the human brain—arguing for the likelihood of a ‘snake detector, a face recognition device, a language acquisition device,’ for example (Sperber and Hirschfeld 2004:41). Ironically, Fodor criticizes proponents of evolutionary psychology who argue for ‘massive modularity’ scathingly (Fodor 1988; see also Samuels 1998). 10. For example, Fahle and Poggio 2002; Gibson 1963; Green et al. 2004; Vaina et al. 1998. For another example of sensory learning, see Smell, fear and sensory learning here at Neuroanthropologyy. 11. See also Quinn and Strauss 2006:272. Bach-y-Rita, Paul. 1972. Brain Mechanisms and Sensory Substitution. New York: Academic Press. Bach-y-Rita, Paul, C. C. Collins, F. A. Saunders, B. White, and L. Scadden. 1969. Vision substitution by tactile image projection. Nature 221(5184):963-964. Boyden, Edward S., Akira Katoh, and Jennifer L. Raymond. 2004. Cerebellum-dependent learning: the role of multiple plasticity mechanisms. Annual Review Neuroscience 27: 581-609. Broussard, D. M., and S. G. Lisberger. 1992. Vestibular inputs to brain stem neurons that participate in motor learning in the primate vestibuloocular reflex. Journal of Neurophysiology 68: 1906-1909. Cheng, K., and R. Gallistel. 1986. Testing the geometric power of an animal’s spatial representation. In Animal Cognition, ed. H. Roitblat, T. Bever, and H. Terrace. Mahwah, NJ: Erlbaum. Chiao, Joan Y. and Nalini Ambady. 2007. Cultural Neuroscience: Parsing Universality and Diversity across Levels of Analysis. In Handbook of Cultural Psychology. S. Kitayama and D. Cohen, eds. Pp. 237-254. New York: Guilford Press. Chiao, Joan Y., Zhang Li and Tokiko Harada. 2008 (forthcoming). Cultural Neuroscience of Consciousness: From Visual Perception to Self-Awareness. Journal of Consciousness Studies 15(10-11). Chomsky, Noam. 1980. On cognitive structures and their development: A reply to Piaget. In Language and Learning: The Debate between Jean Piaget and Noam Chomsky. M. Piattelli-Palmarini, ed. Pp. 35-54. Cambridge: Harvard University Press. _____. 1988. Language and Problems of Knowledge. Cambridge, MA: MIT Press. Clement, G., T. Pozzo and A. Berthoz. (1988). Contribution of eye positioning to control of the upside-down standing posture. Experimental Brain Research 73: 569-576. Clement, G., and D. Rezette. 1985. Motor behavior underlying the control of an upside-down vertical posture. Experimental Brain Research 59: 478-484. Danilov, Y. P., M. E. Tyler, K. L. Skinner, R. A. Hogle and P. Bach-y-Rita. 2007. Efficacy of electrotactile vestibular substitution in patients with peripheral and central vestibular loss. Journal of Vestibular Research 17: 119–130. Doidge, Norman. 2007. The Brain That Changes Itself; Stories of Personal Triumph from the Frontiers of Brain Science. New York: Penguin. Fahle, Manfred, and Tomaso Poggio, eds. 2002. Perceptual Learning. Cambridge, Mass. : MIT Press. Fodor, Jerry. 1983. Modularity of Mind: An Essay on Faculty Psychology. Cambridge, Mass. : MIT Press. _____. 1998. In Critical Condition: Polemical Essays on Cognitive Science and the Philosophy of Mind. Cambridge, Mass. : MIT Press. _____. 2000. The Mind Doesn’t Work That Way: The Scope and Limits of Computational Psychology. Cambridge, MA: MIT Press. Gauthier, G., R. Thouvaecq, and D. Chollet. 2007. Visual and postural control of an arbitrary posture: The handstand. Journal of Sports Sciences 25(11):1271 – 1278. Gibson, Eleanor J. 1963. Perceptual Learning. Annual Review of Psychology 14: 29-56. Gibson, James J. 1966. The Senses Considered as Perceptual Systems. Boston: Houghton Mifflin Company. _____. 1979. The Ecological Approach to Visual Perception. Boston: Houghton Mifflin. Grasseni, Cristina. 2004. Skilled vision: An apprenticeship in breeding aesthetics. Social Anthropology 12 (1): 1-15. Green, A. M., Y. Hirata, H. L. Galiana, and S. M. Highstein. 2004. Localizing Sites for Plasticity in the Vestibular System. In The Vestibular System. Stephen M. Highstein, Richard R. Fay, and Arthur N. Popper, eds. Pp. 423-495. New York: Springer. Han, Shihui, and Georg Northoff. 2008. Culture-sensitive neural substrates of human cognition: a transcultural neuroimaging approach. Nature Reviews Neuroscience 9:646-654. Hermer, Linda, and Elizabeth Spelke. 1996. Modularity and development: The case of spatial reorientation. Cognition 61(3):195-232. Hirschfeld, Lawrence A., and Susan A. Gelman, eds. 1994. Mapping the Mind: Domain Specificity in Cognition and Culture. Cambridge: Cambridge University Press. Horak, Fay B. and Jane M. Macpherson. 1996. Postural orientation and equilibrium. In Exercise: Regulation and Integration of Multiple Systems (Handbook of Physiology, Revised Edition), ed. L. Rowell and J. Shepherd. Pp. 255-292. Oxford and New York: Oxford University Press. Laughlin, Charles D. 1992. Time, Intentionality, and a Neurophenomenology of the Dot. Anthropology of Consciousness 3 (3-4): 14-27. Lisberger, S. G., T. A. Pavelko, H. M. Bronte-Stewart and L. S. Stone. 1994. 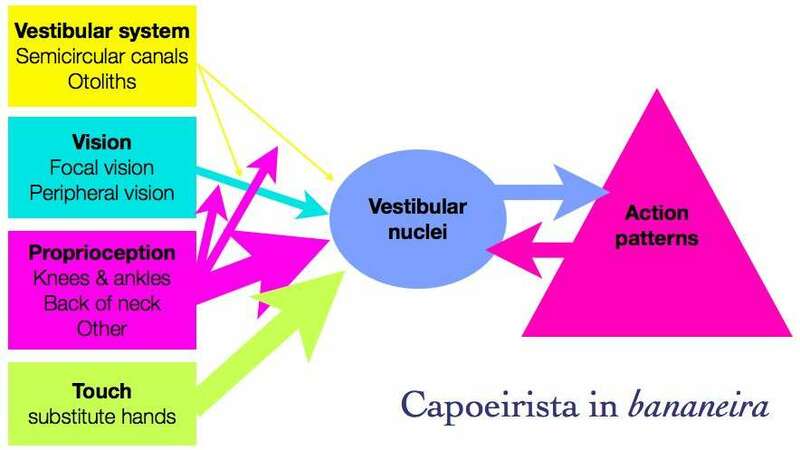 Neural basis for motor learning in the vestibuloocular reflex of primates. II. Changes in the responses of horizontal gaze velocity Purkinje cells in the cerebellar flocculus and ventral paraflocculus. Journal of Neurophysiology 72(2):954-973. Mahboobin, Arash, Patrick J. Loughlin, Mark S. Redfern, Stuart O. Anderson, Christopher G. Atkeson, and Jessica K. Hodgins. 2008. Sensory adaptation in human balance control: Lessons for biomimetic robotic bipeds. Neural Networks 21:621-627. Marin, Ludovic, Benoît G. Bardy, and Reinoud J. Bootsma. 1999. Level of gymnastic skill as an intrinsic constraint on postural coordination. Journal of Sports Science 17(8):615-626. Martin, Emily. 2000. Mind-body Problems. American Ethnologist 27(3): 569-590. Mergner, Thomas, Maurer C, Peterka RJ. 2003. A multisensory posture control model of human upright stance. Progress in Brain Research 142:189–201. Nisbett, Richard E. and Takahiko Masuda. 2003. Culture and point of view. Proceedings of the National Academy of Science (USA) 100(19): 11163-11170. Noë, Alan. 2004 Action in Perception. Cambridge, MA: MIT Press. Notman, Leslie A., Paul T. Sowden, and Emre Özgen. 2005. The nature of learned categorical perception effects: a psychophysical approach. Cognition 95: B1-B14. Oie, Kelvin S., Tim Kiemel, John J. Jeka. 2002. Multisensory fusion: simultaneous re-weighting of vision and touch for the control of human posture. Cognitive Brain Research 12:164-176. Pinker, Steven. 1997. How the Mind Works. New York: Norton. Poulton, E. C. 1957. On Prediction in Skilled Movements. Psychological Bulletin 54: 467-478. Pylyshyn, Zenon. 1999. Is vision continuous with cognition? : The case for cognitive impenetrability of visual perception. Behavioural and Brain Sciences 22: 341-423. Quinn, Naomi, and Claudia Strauss. 2006. Introduction to Special Issue on The Missing Psychology in Cultural Anthropology’s Key Words. Anthropological Theory 6(3): 267-279. Samuels, Richard. 1998. Evolutionary Psychology and the Massive Modularity Thesis. The British Journal for the Philosophy of Science 49(4): 575-602. Sperber, Dan, and Lawrence A. Hirschfeld. 2004. The Cognitive Foundation of Cultural Stability and Diversity. Trends in Cognitive Sciences 8(1): 40-46. Sutton, John. 2007. Batting, habit, and memory: the embodied mind and the nature of skill. Sport in Society 10(5):763-786. Thompson, Evan, and Francisco J. Varela. 2001. Radical Embodiment: Neural Dynamics and Consciousness. Trends in Cognitive Sciences 5 (10):418-425. Tyler, Mitchel, Yuri Danilov, and Paul Bach-y-Rita. 2003. Closing an open-loop control system: vestibular substitution through the tongue. Journal of Integrative Neuroscience 2:159-164.
van der Kooij, Herman, Ron Jacobs, Bart Koopman, and Frans van der Helm. 2001. An adaptive model of sensory integration in a dynamic environment applied to human stance control. Biological Cybernetics 84: 103-115. Vaina, Lucia M., John W. Belliveau, Eric B. des Roziers, and Thomas A. Zeffiro. 1998 Neural Systems Underlying Learning and Representation of Global Motion. Proceedings of the National Academy of Sciences (USA) 95:12675-12662. Varela, Francisco J., Evan Thompson, and Eleanor Rosch. 1991. The Embodied Mind: Cognitive Science and Human Experience. Cambridge, MA: MIT Press. Vogel, Steven. 2001. Prime Mover: A Natural History of Muscle. New York: W. W. Norton & Company. Wheeler, Michael. 2005. Reconstructing the Cognitive World: The Next Step. Cambridge, MA: MIT Press. Wheeler, Michael, and Andy Clark. 2008. Culture, embodiment and genes: unravelling the triple helix. Philosophical Transactions of the Royal Society B 363(1509): 3563-3575. This entry was posted in Brain Mechanisms, Embodiment, Ethnography, general, Human variation, Learning, Neural plasticity, Perception and the senses, Skill acquisition, Sport and tagged equilibrium, physical education, training, vestibular sense. Bookmark the permalink. As a full-time spatial orientation (“vestibular”) researcher, I was not sure what to expect from a neuroanthropology article on equilibrium. However, I found this article to be very interesting and scholarly. Congratulations on a nice piece of work! Thank you for the article. It is scholarly and informative. I needed this information for the kind of work I do in New Jersey. I would love to receive the whole article about it if possible. I am a Capoeira Instructor with more than 14 years of experience and I also work as a Massage Therapist, Personal Training, Back Pain Management and Children with special needs. As far my knowledge allows I believe Capoeira uses 3 stages of balance: dynamic, static and recovery balance. For example: a cartwheel stop in middle of it, go down touch the head on the floor, both legs come down (without touch the toes on the floor) and then straight back up again, finishing the cartwheel on the other side. My knowledge is not even comparable to yours in terms of physiological response, but I believe every stage of the movement required different neurological impulses from the brain, which by all means that every stage requires different kind of balance. I’m so happy to have stumbled across this article again! Your original 2005 piece was passed along to me by my Applied Linguistics professor who knew of my involvement with Capoeira Angola. I’d love an updated article if you’ve done anything else in this respect! I’ve also marveled at the different transformations the art has brought to my daily life.